Four magic scrolls have been stolen by the three lords of evil. Help Tiger Claw on his path to retrieve the valuable scrolls before Fire Fist, Thunder Chain and Angry Tongue can reveal their full potential. Fortunately, Master Lee transferred some of the scrolls' power into the four masks of endurance before the scrolls were taken. Find the masks and use them wisely. As Confucius said: He that would perfect his work must first sharpen his tools. 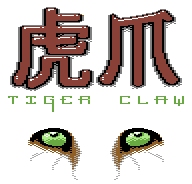 kickstarter page: Tiger Claw as an extra in "The story of the Commodore 64 in pixels"
RGCD page: Tiger Claw at the "RGCD C64 16k competition 2014"
The boxed version is available at the RGCD shop! 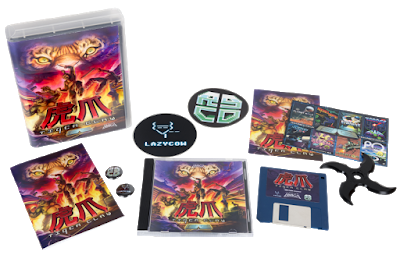 The Amiga CD also includes ADF/DMS versions, Windows/Mac/Linux builds, the OST and it's bootable on CD32 and CDTV.